Now more than a year removed from their (disappointing) Super Bowl run, the Atlanta Falcons are surely eager to find the few missing pieces needed to give their proven signal-caller, Matt Ryan, enough to hoist the Lombardi Trophy. Though spoiled with star wide receiver Julio Jones at his side, Ryan is still without a fully equipped arsenal on the offensive side of the ball, and his defense is similar in that it’s also close but no cigar. Of course, Falcons general manager Thomas Dimitroff has built his star-studded roster through the draft (see Deion Jones, Keanu Neal, Vic Beasley, Devonta Freeman, Tevin Coleman) and will continue to do so, but his draft-centric approach shouldn’t completely keep him from the free agent pool. Entering the offseason as a restricted free agent, Allen is expected to stay put in Atlanta barring an unforeseen fallout. 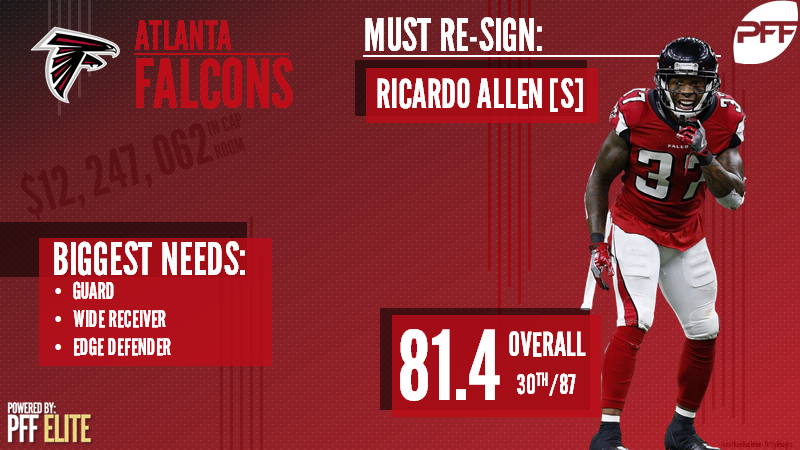 Just 26 years old, Allen has put together two consecutive seasons of strong play in 2016 and 2017 after joining the Falcons as a fifth-rounder out of Purdue in 2014. Playing over 2,400 defensive snaps in the two-year span, Allen earned 81.7 and 81.4 overall grades, respectively, as the Falcons’ primary free safety alongside Keanu Neal. While small in stature (5-foot-9, 185 pounds), Allen excelled in coverage, leading all qualifying NFL safeties in coverage snaps played per reception allowed (71.0), yards allowed per coverage snap (0.18) and coverage snaps played per target (39.4). As Allen and Neal continue to blossom into one of the best safety duos in the NFL, Dimitroff should prioritize keeping the pair intact this offseason. PFF’s All-Pro left guard this past season, Norwell has quietly become one of the few premier guards in this league, notching 82.0-plus overall grades in all four years of his career and capping his strong start off with a career-high 88.8 overall grade in his contract year. The former undrafted free agent has far exceeded expectations since signing with Carolina in 2014, all while playing at least 800 offensive snaps in all four seasons. Most recently, Norwell ranked No. 2 among qualifying guards in PFF’s pass-blocking efficiency (98.3), allowing only 13 quarterback hurries on 564 pass-block snaps during the regular season. He was also the only guard with at least 200 pass-block snaps to not allow a hit or sack in 2017. Norwell matches his efforts in pass protection in the run game, earning the fourth-lowest percentage of negatively graded blocks among qualifying guards last season. With Andy Levitre battling injury throughout the tail-end of the season, Falcons guards Ben Garland and Wes Schweitzer finished the season as the team’s two starters at guard. The youthful duo’s lack of experience was on full display, as both finished with sub-45.0 overall grades on the season. It’s unlikely either of the two is in the conversation as long-term solutions, and Levitre will be entering his 10th season in 2018 if he chooses to keep his cleats off the rack. As such, signing a 26-year-old guard in his prime like Norwell fits the bill for Dimitroff & Co.
As coveted as Norwell will be on the free market, it’s unlikely Dimitroff is able to outbid the competition come free agency, especially with the Falcons’ current cap situation (26th in available space as Jan. 29). With that said, Atlanta could opt for a cheaper, yet serviceable option in former Titans guard Josh Kline. The five-year veteran has earned 72.0 overall grades in three of his last four years in the league, most recently recording a 75.8 mark in 2017. Among guards with at least 340 pass-block snaps, Kline ranked T-No. 13 in pass-blocking efficiency at 97.4, allowing just 19 total pressures on 552 pass-block snaps. While Kline didn’t draw a crowd to his run-blocking performance last season with his 46.4 run-block grade in 2017, his ability in pass protection should have a handful of suitors asking for his John Hancock on a contract in March. Pryor’s breakout performance amid sloppy quarterback play with the Cleveland Browns landed him a one-year, $8 million prove-it deal with the Washington Redskins last offseason. Unfortunately for both Pryor and the Redskins’ offense, Pryor didn’t do much other than disappoint. The former quarterback turned wide receiver was likely wishing he was back under center for at least parts of the year prior, as he averaged a team-low 1.01 yards per route run in 10 games before being put on the shelf to have surgery on a lingering ankle injury first suffered in Week 2. He finished the year as the 109th-ranked wide receiver among 116 qualifiers in terms of overall grade (43.1). Pryor’s underwhelming visit to the nation’s capital should prevent the Redskins from re-signing him this offseason, giving the five-year veteran a much-needed fresh start. In Atlanta, Pryor would reap all of the benefits that accompany having Ryan leading the huddle and Jones drawing double coverage. Also, with Mohamed Sanu playing a majority of his offensive snaps in the slot (67.6 percent), Pryor would step in as an immediate upgrade over pending free agent Taylor Gabriel and third-year East Carolina University product Justin Hardy outside the hashes.